Home inspections will always be a part of life as a homeowner. Inspections help you keep your home safe and secure. With proper maintenance and timely response to, and you can protect your investment for years to come. If you’re looking to sell or take out a new mortgage, a home inspection can let you see where you stand and hopefully give you an easy-to-read document you can share with all interested parties. Home inspection reports can be long, detailed, and often hard to read. Fortunately, technology has made it simpler than ever to give you that detailed information in one easy-to-navigate format. 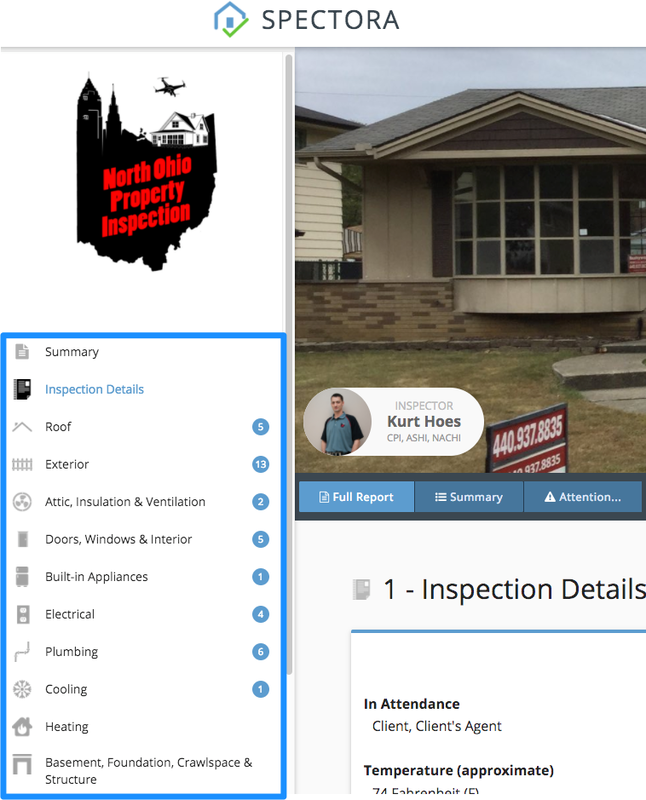 Here at North Ohio Property Inspection, we used the top home inspection software to generate our reports so you can easily get the information you need. Here are the main features to look for in your home inspection report. The linked table of contents to the left of the online report gives you quick access to each area of your home. If you suspect a problem in a particular area of your home, click on that line. For example, if you know there’s a plumbing leak somewhere in your home, you can click on plumbing and go directly to that section. For quick reference, you’ll find a number next to each section. This number shows how many issues the inspector found in that area of your home. The summary section gives you a good big-picture overview of the problem areas in your home with special emphasis on any issues which could present a hazard. If you want to drill down even more, the report filter buttons let you see only the dangerous problems. These are the problems you will want to address as soon as possible. Dangerous issues include problems such as electrical wiring and damaging leaks. In order to help you assess areas of concern, high quality images show where the problems are. Annotations point to damage that you might not have noticed, such as water stains and peeling paint. These images make it easier for you to see the damage for yourself. For DIY jobs, you can then go in and make repairs. For jobs requiring professionals, pictures make it easier to show them where to start. In addition to pictures, your home inspection report also contains detailed explanations of the defects found. You can save you a lot of headaches down the road by following the advice given here. opens, such as repairing external trim. In these cases, a little wood and paint now can help protect your home from far more expensive damage in the future. For issues requiring a licensed professional, some items on your home inspection report include a small tip on which type of professional to contact for a more in-depth assessment and/or a quote. Some minor issues may require a licensed handyman. For more serious problems, you may need a plumber, electrician, or roofer. In order to find the right solution for this particular problem, contact the listed professional for a quote. In addition to inspection concerns, certain informational details can help you get repairs and also help you be aware of what is going on in your home. Your home inspection report also includes information such as the style and type of your roof, shingle material, and drainage systems. This information is great general knowledge to have of your investment. If you are looking to sell, this information can be valuable to prospective purchasers. This information can also help with appraisal, with your insurance company, and even for your own identification. We hope this guide gives you an idea of what a quality home inspection report should look like. If you’re in the market to buy a home, be sure to check out the sample reports of inspectors you’re shopping. If you’re an agent, ask us about how our reports help save you time when preparing your repair addendum documents!